How has everyone fared this winter storm? Being ice bound has given me some lovely, guilt-free time to work on my writing projects. 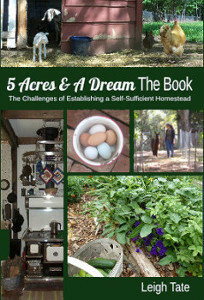 The result is that I am very pleased to announce the fifth ebook in my The Little Series of Homestead How-Tos. 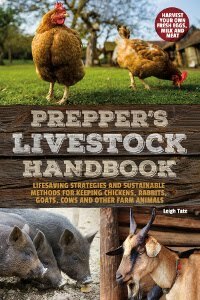 I'm hoping it will be a useful resource for gardeners, homesteaders, homeschoolers, or anyone interested in the soil. Like the other ebooks in the series, it includes a glossary and resources for digging deeper. List price is $1.99 USD, but I am offering it for free - today and tomorrow only. The free offer is at Smashwords, where you can choose any eReader format, including a PDF version for those who wish to read it on their computer. Simply enter the code RZ77V (expired) at checkout. It's also available at Amazon, although I don't have an option there for a coupon code there. Still, for $1.99 you can have it auto-delivered directly to your Kindle. I very much hope you will enjoy it, and that you will consider it worthy of a good review at either Amazon, Smashwords, or both! Youve done it again. Well done. Im glad i have you in my corner. Lets hope that the WWW never goes down so we can stay linked. Have you ever thought of a "generosity enabler" similar to Ben Hewitt's. I would support your writing. 99 cents for this work is criminal. Lynda, thank you for your kind words and for the review! Those are key to sales. Pricing eBooks is a bit tricky. Fiction writer, at least, feel they have to offer something like 7000 to 9000 words minimum for 99 cents, or else the public thinks they've been overcharged. Apparently the idea that there are no print costs equates to the right for a cheaper product (never mind all the hours and hours that went into it!). That's fiction, and nonfiction buyers are said to be more forgiving, but even so, my little eBooks are only about half the size. Since I'm just getting this series off the ground, the last thing I need is review dings for price versus content. All that aside, I treasure your encouragement and support! I will read it and I will review it, but I won't be able to USE it for about another two months! ICE CRUST!!!! Funny it might be but it gives the reader a chance to contribute, participate and to show appreciation for effort. I've generously enabled Ben for 12 months now and im ready to move on. Thank you Barb! We're bracing for the next winter blast ourselves. Lynda, you've certainly given me something to think about and I appreciate it. Excellent! And this time I figured out how to change the format to something my computer can run....yeah! Thanx for working so hard on these. We will be soil testing soon since our weather has been so mild. Thank you for providing a great How to book. I wish I had your book several years back when we first moved into this rental home. We found out the hard way the soil here is terrible. All of our garden beds are raised, and we hauled in new soil, peat, and mixed it all with compost and animal fertilizer. Now flowers, vegetables, and fruit grow in the soil. I will be holding on to this great resource and using it at our next place. Thank you for your generosity. I am excited to read your book on soil testing. I am looking to become a better gardener and know that I lack in this area. Thanks again. Karen, Sandy, and Kelly, you are very welcome. I just hope you all and everyone else who is downloading a free copy will be kind enough to do a review for me on both Smashwords and Amazon (you don't have to have purchased it from Amazon to leave a review). I was going to say that you are a wealth of knowledge, but I think I prefer Treasure chest of knowledge! Thank you for sharing all of your hard work. I will definitely leave a review in both places! 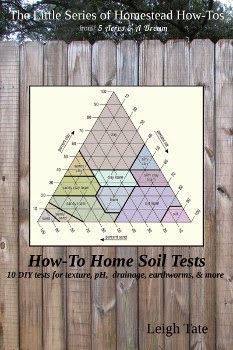 Hi Leigh, I just downloaded your soil book, looking forward to reading and reviewing on my blog. I finished reading your real book last year, but I only just got around to reviewing it, I'll send you the link when I publish it next week :) I love reading about what you're up to over there, lots of great ideas that I can use too. Hi Leigh! Great timing! Even though we are in a string of single digit temperature days, I've been thinking about the garden and doing some soil tests (when it all thaws out). Bought this one and two more, and I'm looking forward to getting into them. Thank you so much for your informative blog, book, and this ebook. If Spring ever arrives I will be anxious to try this out. Currently house bound due to a tropical cyclone baring down on us. Lots of much needed rain, we have been drought declared for nearly two years, and strong winds, but not yet destructive. Here's hoping to come through this well watered and not battered. Mark, thanks! We currently have 15° F going on outside so at the moment all of my gardening is in my head and on paper. Jane, oh my, that sounds worrisome. I hope it brings an end to your drought and a productive garden and harvest for you in the future. I have left a review at both Smashwords and Amazon. Your book is going to be very useful to me. I also purchased your how to make salves book. I can't wait to dive into it. Wow that's awesome! I will have to make sure I pick it up! This cold winter has meant a lot of homework time for me unfortunately but I have been doing a lot of writing and crafts whenever I get the time to try and balance out my crazy schedule! Leah, have to agree on balance! And I hope you enjoy the book!